This night scene is set in a narrow, irregular space -a sort of grotto with a gabled opening in the back, consisting of two semi-circular arches. Mary holds her newborn Son, naked on her lap, while Saint Joseph and three shepherds surround them, expressing their fervent devotion to the child. A kneeling ox also contemplates the baby. The compositional ellipse is closed at the top by a group of angels very close to the holy family. They express Heaven’s pleasure at the birth of the Redeemer, bearing a banner that reads GLORIA IN EXCEL[SIS DEO E]T IN TERRA PAX [HOMINIBUS]. 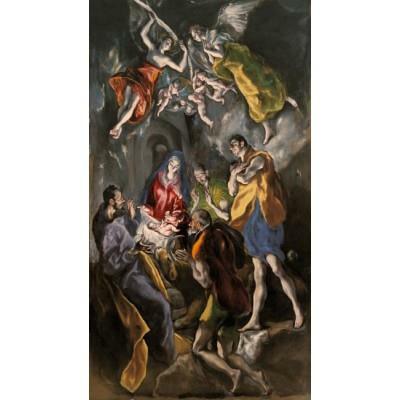 This Nativity scene can be considered El Greco’s last work before his death on April 7, 1614. 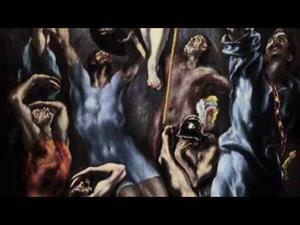 It was intended to adorn the burial place of the Theotocopuli family at the convent of Santo Domingo del Antiguo (Toledo), where El Greco had received his first commission in Spain, in 1557. 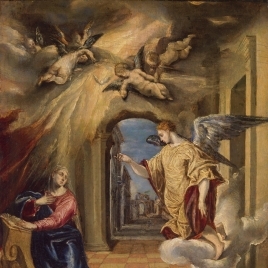 In August 1612, that religious community reached an agreement with El Greco’s son, Jorge Manuel, in which the convent ceded a slab in the church of that monastery, which is the one bordering the main door of said church. That space was to serve as the burial area for the Theotocopuli, who promised to pay for the conditioning and decoration of the family tomb. 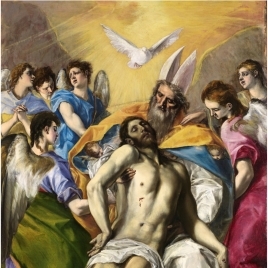 In fact, besides El Greco, his son’s wife, Alfonsa de Morales, was also buried there. 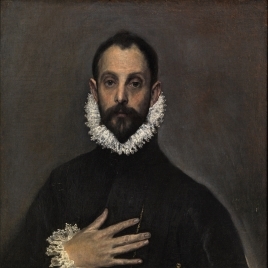 However, a disagreement between the two parties led to the cancelation of their agreement in 1618, just four years after El Greco’s death. 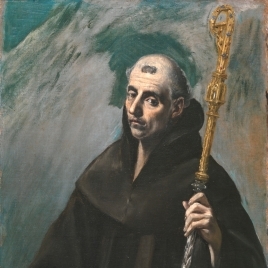 The Cistercian nuns demanded that Jorge Manuel exhume the remains, but the large canvas conceived and painted by El Greco remained in the church until its sale to the Spanish State in 1954. 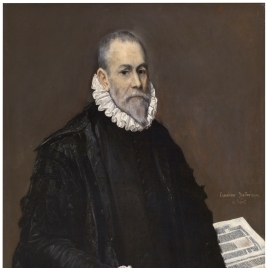 This canvas marks the culmination of the formal refinement of the composition with which the painter had depicted this subject in his last versions, from between 1597 and 1605, for the altarpieces of Doña María de Aragón (now at the Muzeul National de artà, Bucharest), the Colegio del Patriarca in Valencia, and the Hospital de la Caridad in Illescas (Toledo). 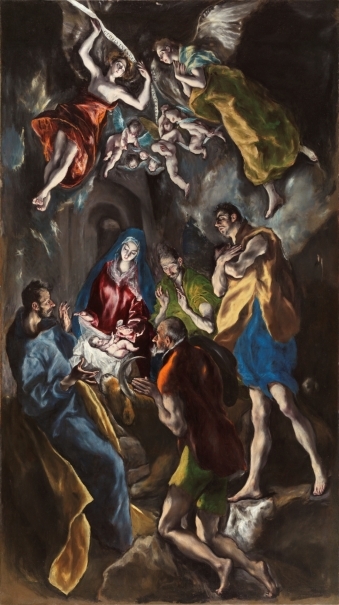 The Christ Child emits an intense light that bathes the small group contemplating him: the Virgin, Saint Joseph, three shepherds and a group of angels that form a sort of celestial vault. 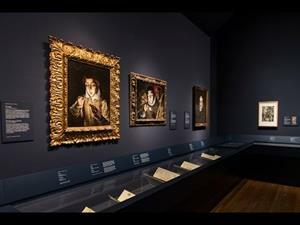 These figures constitute an excellent selection of this artist’s highly characteristic creations. 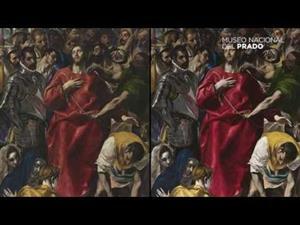 The Metropolitan Museum of New York has a workshop version with slight variations, which was apparently made around the same time as the original canvas (Text drawn from Ruiz, L.: El Greco en el Museo Nacional del Prado. 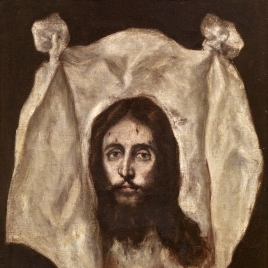 Catálogo Razonado, Museo Nacional del Prado, 2007, p. 168; El Greco. 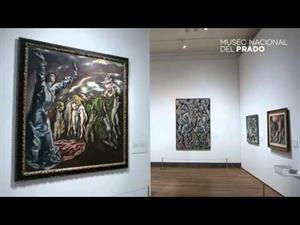 Guía de sala, Fundación Amigos del Museo del Prado, 2011, pp. 46-48). Height: 319 cm. ; Width: 180 cm. Chapel of the Monastery of Santo Domingo el Antiguo, Toledo; acquired by the State for the Prado Museum, 1954.